The Lab’s post also focuses on the changes made to land pricing in SL – arguably the biggest set of changes in 2018. It’s fair to say that overall, the response to changes both Mainland and Private regions has been positive. In fact, it could be one – and I emphasise one, because there are others – of the reasons people might be spending less: with limited disposal income, people may have diverted some of their Second life spending away from buying things and into premium memberships and / or land. 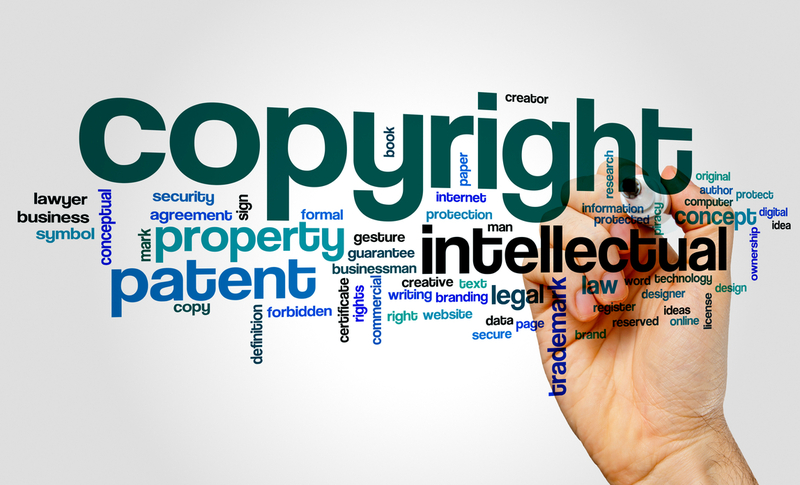 For me, the big projects through 2018 and 2019 have been, and remain, the Environmental Enhancement Project (EEP) and the attempt to move Second Life to the cloud. The latter is hard to judge, as it is very much a behind-the-scenes move that has yet to really have an impact on the user-facing side of the platform. however, I fully expect we’ll be hearing more about it in 2019. 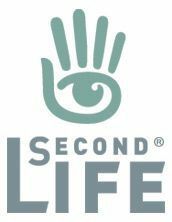 EEP, on the other hand, is something I think will help revolutionise the look of Second Life – even if not quite to the extent some may hope. As such, I’m actually more excited about this than Animesh (and have had great fun playing with EEP whilst it has been in beta testing). In particular, it will finally bring environment control down to the parcel level, as well as allowing different environment settings at different altitudes. These two capabilities have, until EEP, been dependent on purely viewer-side support and limited to the use of the likes of Firestorm. With these capabilities now moving server-side, everyone gets to benefit from them, regardless of the viewer they’re using, and region / parcel holders finally get the opportunity to have users see their regions and locations as they desire (allow for people retaining the ability to override, viewer-side), and without having to request they change their viewer settings manually, or having to worry about whether or not the windlight they are using is generally available. Again, EEP won’t be appearing fully until 2019, but the Lab’s blog post includes a nice little preview video by Silas Merlin that I’m taking the liberty of reproducing here. 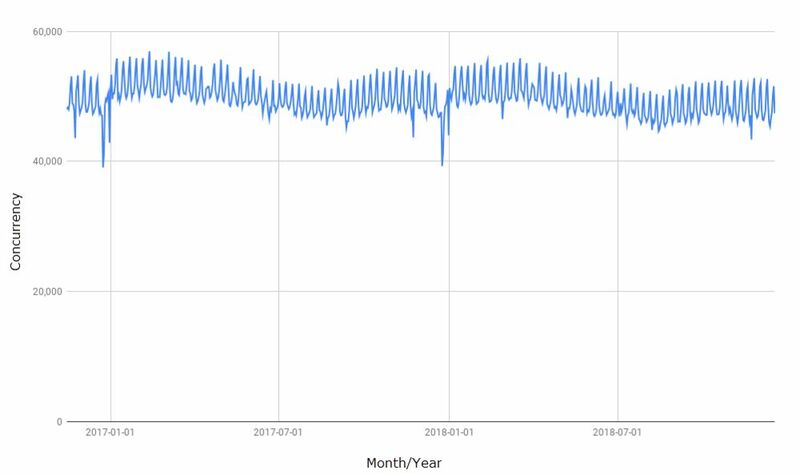 For me, the most interesting part of the Lab’s blog post comes at the end, starting with a chart showing average concurrency over the last two years. It shows levels to be relatively stable. Of course, there might be a temptation to offer contrasts between this chart and others that report more in the way of averages over shorter periods – such as those found on the Firestorm log-in screen or via infographics such as those shown on Tateru Nino’s stats pages (which appear to be recording again after having problems earlier in the year). However, given there is no actual benchmark for the Lab’s chart, such comparisons would be somewhat off-base; the chart isn’t designed to show averages or daily high-lows. It simply shows a 730-day period in which the peak daily log-ins (I would assume) have remained pretty constant, despite all the claims of falling numbers. The flipside of this of course, is that equally, it’s hard to really judge such a broad trend like as this, simply because it is likely taken from one data point, be it peak daily log-ins or something else. For example: if it is tracking just peak log-ins, what were the daily minimums? How long per day were the peak periods? have there been any changes in this over the two years? A more interesting stat is that for the amount of USD cashed-out. Put at $65 million, this is only $2 million less than that quoted for 2017, and still above the US $60 million for 2016. As such, it stands at odds with claims that the Second Life economy has been in some kind of slump during at least the second half of 2018, suggesting that things have been relatively stable overall. Which is not to say that some merchants haven’t seen a downturn in sales; but these could be the result of people shifting their spending habits more that not spending their money – see my comment re land, above. The final two listings on the Marketplace and the Destination Guide make for interesting reading, but little more – although the fact that men’s apparel comes in 10th on the Marketplace while women’s comes in second might be an interesting topic to plumb. Is it simply because there are fewer creators focusing on menswear, or is it a combination of fewer creators and male Second Life users perhaps being less driven by the demands of fashion? 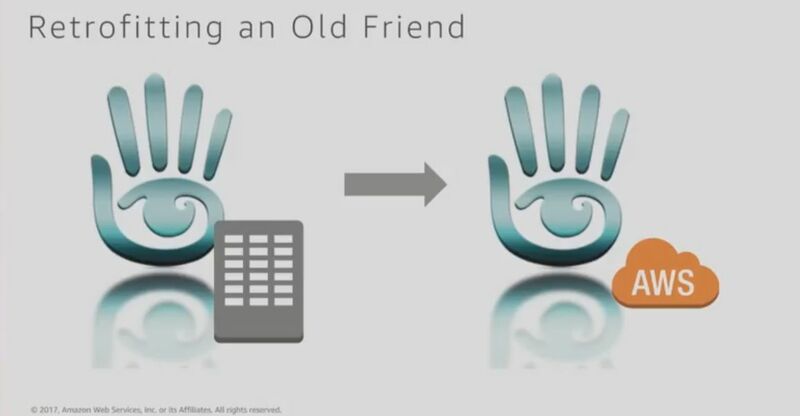 As noted, I’ll have more on the technical and other updates to Second Life in an upcoming article, and for now will leave you to read the Lab’s summation in peace 🙂 . In 2016 I wrote about the work of Tom Boellstorff and Donna Z Davis (respectively Tom Bukowski and Tredi Felisimo in Second Life). Since 2015 Donna – a strategic communications professor at the University of Oregon specialising in mass media & society, public relations, strategic communication, virtual environments and digital ethnography – and Tom – a professor of anthropology at the University of California, Irvine – have been engaged in a National Science Foundation funded study formally entitled Virtual Worlds, Disability, and New Cultures of the Embodied Self, and more informally referred to as Our Digital Selves. Their work, which will continue through into 2018, focuses on the experiences of people with disabilities – visible and invisible – who are using immersive virtual spaces to represent themselves, possibly free of the shadow of any disability, engage with others and do things they may not be able to do in the physical world. The work encompasses many aspects – physical, mental, technical, for example – of occupying both a physical space and a digital environment when living with both visible and invisible disabilities – the benefits that can be enjoyed, together with the potential risks / fears. Some of these aspects, particularly the more positive, are perhaps familiar to us: the power of being defined by who we are as a person, rather than in terms of a disability; the freedom presented by the ability to embody ourselves within an avatar howsoever we like, and so on. Other may not have been fully recognised for the fear they can create; while the “new era” for VR system may well be liberating for the able, it can be a frightening / debilitating threat for some with disabilities. Given the extent of the study, it obviously crosses the physical / digital divide. There have been experiments and discussions in-world. And there have been real-world interactions between Tom and Donna and those participating in the study. One of those who has been following the study closely is Draxtor Despres. 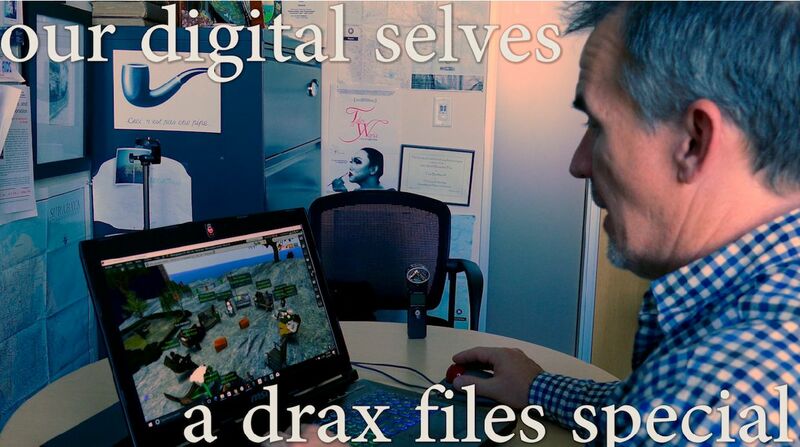 He has featured Tom’s work in The Drax Files World Makers, and is now engaged in producing a documentary – also entitled Our Digital Selves – about the study, travelling with Donna and Tom to meet some of those participating in the work. While not due for release until early 2018, the first official trailer for the documentary was made public on Tuesday, October 11th, 2017. It’s a massive undertaking; Drax goes on to note that there are around 15 participants in the study who have been involved in the filming, and he has around 3 hours of recording with each. Some of this was necessary simply to get to know people and overcome perfectly natural barriers – shyness, nervousness, and so on – and establish trust; however, it still means there is a lot which needs to be synthesised into a cohesive whole, whilst also doing justice to the stories of all of those volunteering to participate in the film. Part of the study has involved participants being provided with a 32m x 32m parcel on Ethnographia Island which they could use to share their experiences, insights, and thoughts on their disability. Shown here, Jadyn Firehawk sands before her exhibition space (May 2016). Nevertheless, the first public trailer does much to establish the structure of the documentary and present an accessible framework against which the broader story will naturally unfold. This promises to be one of the most engaging, moving and informative documentaries on virtual living, embodiment and personal expression since, perhaps, Login2Life, and something that should not be missed once available. In the meantime, I’ll leave you with the trailer – and the hope that, subject to feedback from Donna, Tom, Drax and those involved the work, I’ll be able to bring more on the documentary and the study in the run-up to the release of the completed film. 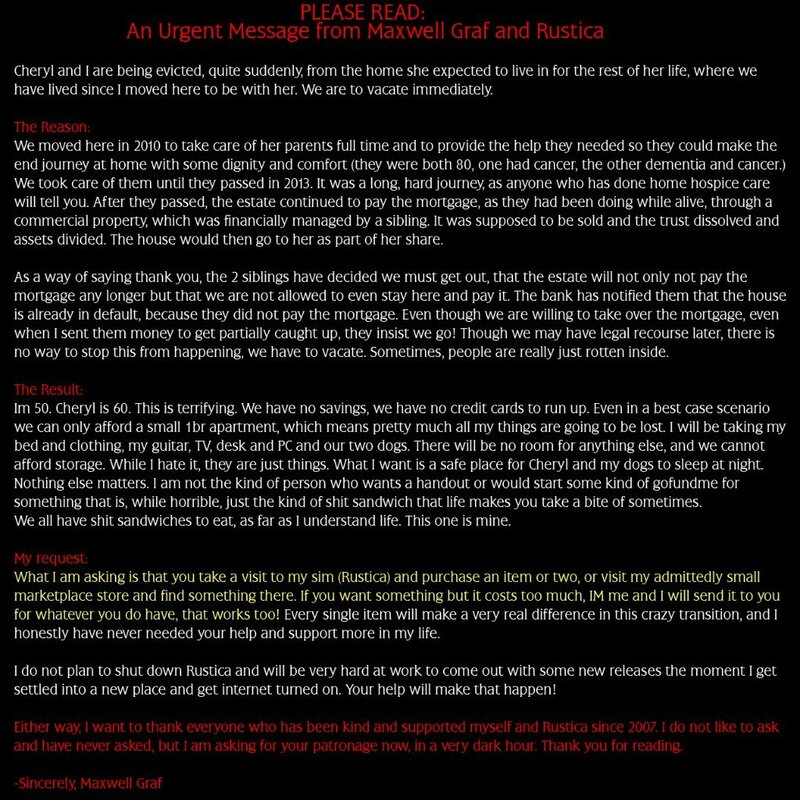 On September 22nd, Maxwell Graf issues a deeply personal, heart-breaking request via Plurk. Related to a personal situation, it included a request for people to buy from his store (in-world or on the Marketplace). The news was broken by Prim Perfect, and quickly circulated by other bloggers (my own report can a little late in the day, so to speak). 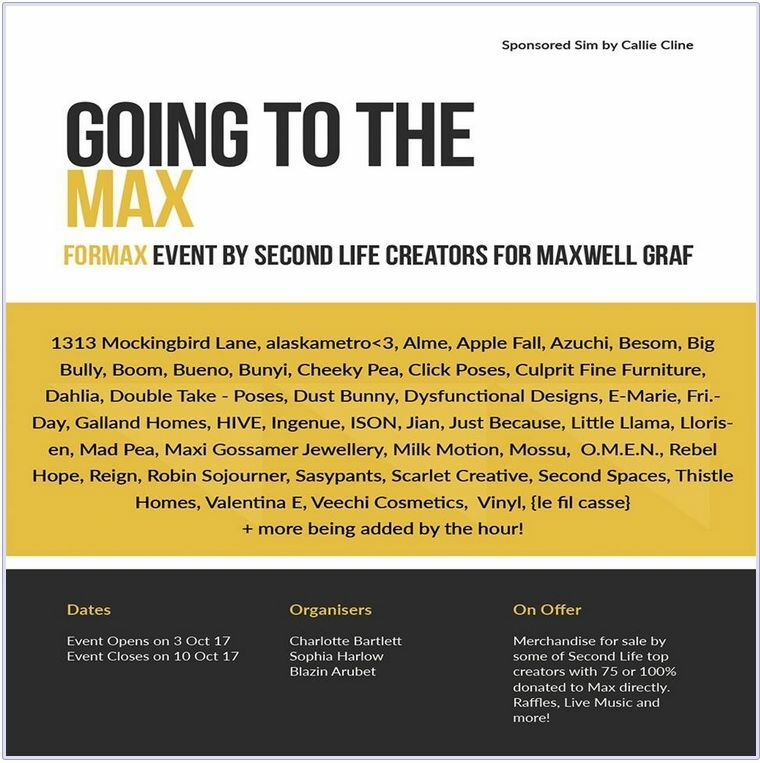 For obvious reasons Max didn’t feel comfortable in asking for more than this, despite the severity of his situation, but that hasn’t stopped friends and fellow creators from rallying around; and on Monday, September 25th, Going to the Max, a special shopping event, organised by Charlotte Bartlett, Sophia Harlow and Blazin Arubet, was announced. Sponsored by Callie Cline, the event will run from Tuesday October 3rd through Tuesday October 10th. Details are still being put together, but the initial announcement for the event, posted to Plurk by Sophia Harlow and reproduced above, reveals the line-up thus far. I don’t know how to receive the massive amounts of love and kindness from so many I know and so many more I don’t…It is a foreign concept to me to get such a cosmic blast of positive affection and concern from so many people at once. It’s really overwhelming and I’m so small right now I can’t do anything but say this over and over, I am humbled beyond my ability to express. In gaming parlance, this would be like if I was a tank amid a team of 10,000 healers and they all suddenly got very gracious on me at the same time and I started growing and then glowing and then my mana reached peak and my head exploded as I turned in to a demigod and could face any enemy. Full details on the event – SLurl for the region, etc. – will be posted in due course, again as things come together, as will more details on how people can get involved. Plurk is one place to keep up with the news, as is Scarlett Creative Facebook page (no Facebook log-in required). In the meantime, don’t forget you can still help Max directly by visiting Rustica in-world or on the MP and buying an item or two … or three! Linden Lab has issued an important notice for international users who have a credit card filed with the company for the payment of services. Due to some unexpected changes with our International Billing system, some Residents outside the United States with a Credit Card on file may have difficulty with their current payment method as of September 30, 2017. In order to avoid any service disruption, we encourage all Residents outside of the United States to please take a moment to log into your account and re-enter your existing Credit Card information. Doing so now will prevent any disruption in in-world and Marketplace purchases, as well as recurring monthly billing for Premium Accounts, Private Regions and monthly Mainland maintenance. If you have difficulty with your payment method after September 30, 2017, updating your payment information will resolve the issue. We apologise for this inconvenience and appreciate your patience as we continue to upgrade our billing systems in order to best service our Residents around the world. If you have any questions regarding this notice, please visit https://support.secondlife.com to contact our Support teams. 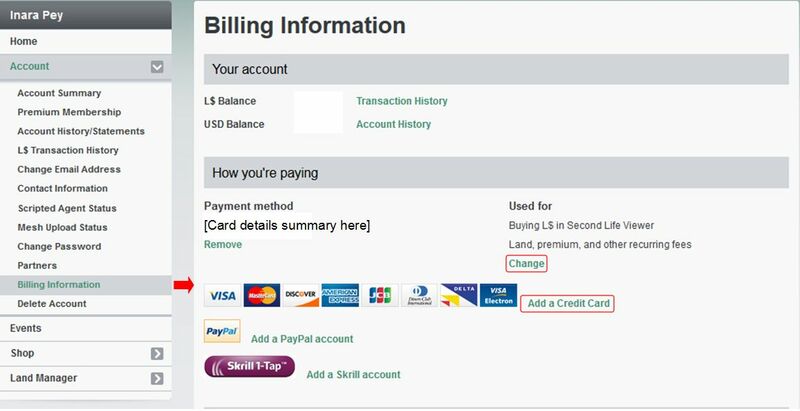 To re-enter your credit card details, go to your account dashboard at secondlife.com, click on Account (top left) and then on Billing Information on the list of options that opens. This will display your billing information summary (sample image below). Make a note of the services the card is Used For on the right, then Remove your card details (option on the left) and then click Add A Credit Card (circled). This will open the form for you to enter your card details. Make sure to click Add Card to add the card to the system. When your card has been recorded, you can check the details under Payment Method, then review the services the card is Used For. Should you need to change any of the latter, click on the Change option (circled under Used For on the right) to display a pop-up of services charged to the card and check / uncheck as required.